When I skimmed the 15 US Dividend Achievers in early 2015, the holdings were split between a few accounts. 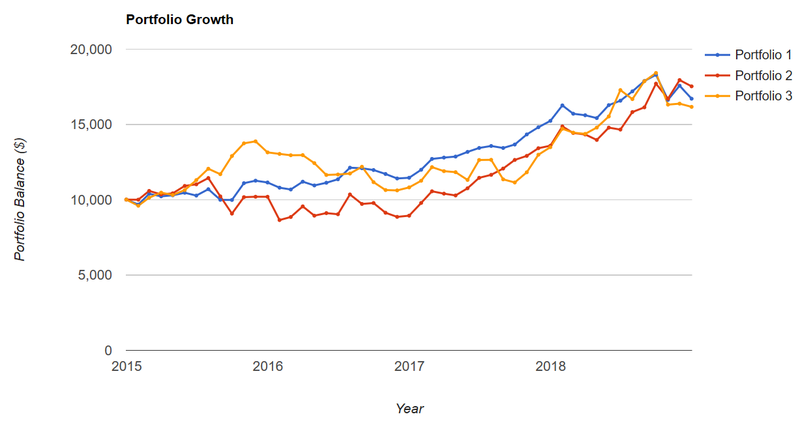 My wife's main RRSP retirement portfolio (think IRA) ended up with the growth component. This basket of 6 companies is trouncing the market with lower volatility. This may be an opportunity to rebalance and move funds to safety. Or should I let it ride? My readers will know that I skimmed 15 of the largest cap Dividend Achievers. Here's Buying Dividend Growth Stocks Without Looking. The 15 companies that I bought are 3M (NYSE:MMM), Pepsi (NASDAQ:PEP), CVS Health Corporation (NYSE:CVS), Walmart (NYSE:WMT), Johnson & Johnson (NYSE:JNJ), Qualcomm (NASDAQ:QCOM), United Technologies (NYSE:UTX), Lowe's (NYSE:LOW), Walgreens Boots Alliance (NASDAQ:WBA), Medtronic (NYSE:MDT), Nike (NYSE:NKE), Abbott Labs (NYSE:ABT), Colgate-Palmolive (NYSE:CL), Texas Instruments (NASDAQ:TXN) and Microsoft (NASDAQ:MSFT). We continue to hold all 15 companies and do not pay them much attention. I have continued to hold even though some of the companies have been removed from the Achievers Index. While I bought them without looking, it does take a remarkably successful company to make its way into the index. I simply did no further evaluation or guesswork. I trusted the index mandates that include at least a 10-year history of dividend increases in concert with the financial health screens. I also have 3 US picks by way of Apple (NASDAQ:AAPL), BlackRock (BLK) and Berkshire Hathaway (BRK.B) (NYSE:BRK.A). Here's an article on that My Three Stocks, Beating My Benchmark And Then Some. That article is from 2017, I am not sure if they are still beating to tell you the truth. I don't look at them with any concern. I certainly know that Apple was beaten up but is charging back. Perhaps I will be creating some more homemade dividends from Apple, soon. Net, net, we hold a portfolio of 18 US companies. We also hold Canadian Dividend payers and Canadian bonds. My wife's freaky retirement growth portfolio. They had a near equal-weight start. The allocation has certainly drifted. Somehow, and perhaps a stroke of 'luck,' my wife is the holder of many of the growthier assets of the mix. She has the techs and the healthcare companies that are doing very well. And then there's Nike. The laggard is Colgate-Palmolive that does not seem to do much but pay out a very modest dividend that is not growing at a very generous clip. But CL can stay. Buy and hold. Here's the returns history from January of 2015 to end of February 2019. 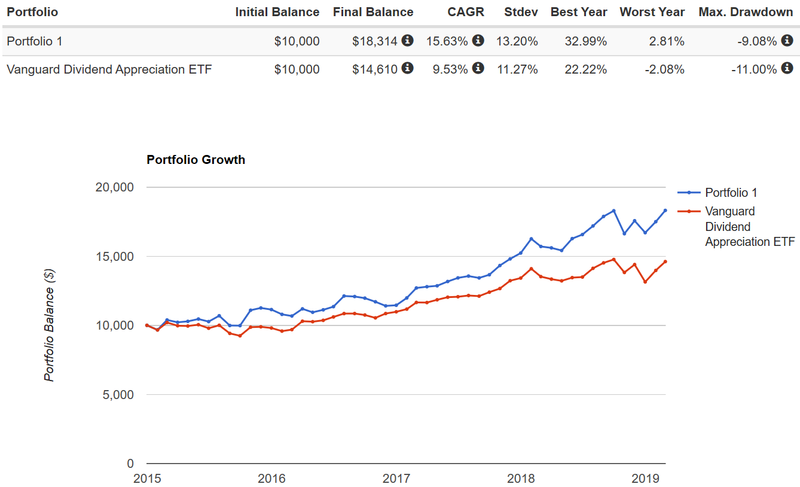 I've used Vanguard's (VIG) the Dividend ETF that tracks the Dividend Achievers Index as the benchmark. The returns for the S&P 500 (IVV) are very similar to VIG. The chart is courtesy of portfolovisualizer.com. Portfolio 1 is the 6 freaky/growthy Dividend Achievers. The returns for VIG for the period are 9.5% CAGR. 4 of the companies are trouncing the market, Colgate-Palmolive and Medtronic are not. My personal returns are likely greater than above. I moved some monies into companies as they were getting beaten up. While that has not always worked out (yet), it certainly provided a boost by way of ABT and Nike. We received a nice boost by investing in those 2 companies when they were out of market favour. Full disclosure, that practice has certainly not paid off with the reinvestments into the greatest laggards in the overall portfolio - they go by the names of CVS and Walgreens. I am hoping that the 'value' hunting will pay off one day for those 2 pharma giants. As for the dividend income and income growth the 6 stocks started with a lesser yield than VIG, but the 6 companies have greater combined dividend growth. Here's what the results would have looked like with dividend reinvestment with an initial $10,000 investment. Portfolio 1 is the Growth 6. While some income is 'nice' this is of course a total return venture. Most of the gains are by way of capital appreciation. Our Canadian companies deliver very generous dividends and dividend growth. That is just by chance, those were the wide-moat companies that I wanted to hold. Big juicy dividends just came along for the ride. It's Canada for big divs and total return for US. I offered that same approach and rationale in the dividend portfolios on my ETF Model Portfolio page. That said, with that dividend growth rate of 10% annual for the US holdings, the income can quickly move into a generous range. The dividend growth rate for the big Canadian dividend payers is 9% annual. But I do not want to live off of the dividend income. Why would I cheat myself to the greater value that sits within the share prices? That will need to be unlocked one day by way of share harvesting. 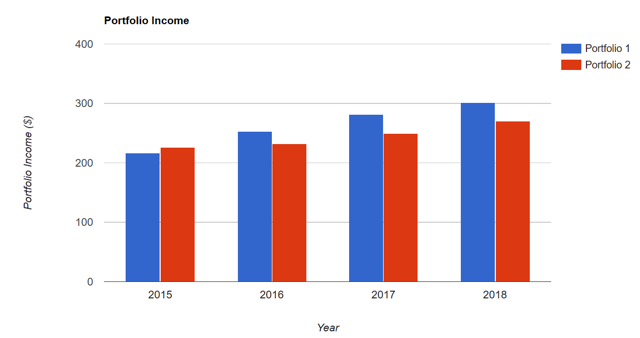 On that please have a read of my most-read Seeking Alpha article, Should Retirees Really Try To Live Off Of The Dividend Income? I understand the attraction and the emotional pull of dividends but we should not cheat ourselves in the long run. I admit to having a guilty pleasure of watching the dividends roll in, and watching the dividends grow. Living off of the dividends does not often align with the most optimal order and arrangement for creating retirement income. Please have a read of The Reasons Why We Don't Use The 4% Rule In Retirement. We need a dynamic income scheme to go with our dynamic spending needs. And taxation shows up to have a word or three as well. What to do with the gains from the freaky portfolio? Of course in a major market correction, that capital appreciation could take a serious haircut. I am considering a portfolio rebalancing that would move some of the gains into US bonds. And those US bonds would be a new addition to the portfolio. The idea of course is that I want to maintain my exposure to the US dollar. The Canadian dollar has been weak. I want some currency hedge and lifestyle hedge moving forward - we love to travel to the US and we need those US greenbacks. What do you think? Let 'em ride, or move some gains to 'safety?' We'll likely start spending some of my wife's monies (from that growth portfolio) in 4 to 5 years. Your input and comments are appreciated. Author's note: Thanks for reading. Please always know and invest within your risk tolerance level. Always know all tax implications and consequences. If you liked this article, please hit that "Like" button. Hit "Follow" to receive notices of future articles. Disclosure: I am/we are long BNS, TD, RY, AAPL, BCE, TU, ENB, TRP, CVS, WBA, MSFT, MMM, CL, JNJ, QCOM, MDT, BRK.B, ABT, BLK, WMT. I wrote this article myself, and it expresses my own opinions. I am not receiving compensation for it (other than from Seeking Alpha). I have no business relationship with any company whose stock is mentioned in this article.